The season for serving soup has arrived……..even here in the South! While I’m not a huge fan of the canned stuff (except when I’m sick! 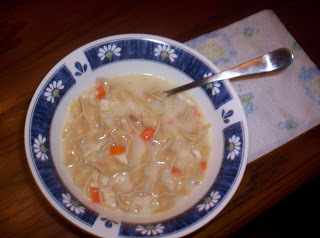 ), I do enjoy homemade chicken noodle soup. This particular recipe is a favorite because of how easy it is to prepare. This would be a good recipe to double since, as written, this is just enough to feed our family for one meal with very little leftover. I have previously tried this with angel hair pasta, but prefer the wide noodles. When I made this soup last week, I used whole wheat noodles and some of my homemade chicken broth and it was delicious! In a Dutch oven, saute the onion, carrots and garlic in oil for 5 minutes or until tender. Stir in the flour, oregano and poultry seasoning until blended; saute 1 minute longer. Gradually add broth; bring to a boil. Stir in the chicken and noodles; reduce heat at simmer for ten minutes or until noodles are tender. Stir in milk. Heat through (do not boil). Add salt and pepper to taste. You can find more great recipes at Tempt My Tummy Tuesday, Tasty Tuesday, Grocery Cart Challenge Recipe Swap and Foodie Friday. I have started making my own chicken noodle soup, this past year. It is so good and comforting. Thanks for your recipe. I have been wanting to try homemade chicken noodle soup. Thanks for sharing this recipe! Oh I love Fall soup season! This sounds delicious. Thanks for sharing. I love a GREAT!!! soup recipe and everyone should have a chicken noodle recipe for the fall. This is definitely the time of year for soup, and I'm always looking for a new recipe. Thanks for sharing! Something about chicken noodle soup is so comforting….especially homemade!